The Balloon Festival in Ferrara is the biggest hot air balloon festival in Italy and one of the most important in all of Europe! 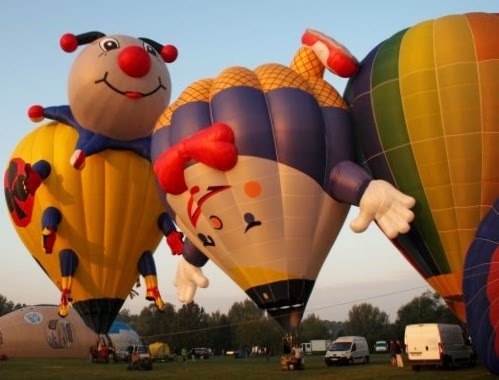 This is an event not to be missed by anyone who is fascinated by these big beautiful balloons. Saturday evening at 21:00 there will be a special event in which the illuminated balloons will fly together in a choreographed show set to music. A festival in Zola Predosa honoring the famous, pink product. On Sunday starting at 9:00 there will be tours of two Mortadella producers. Nothing like meat in the morning! There will also be lots of chances to taste the Mortadella as well as cooking demonstrations and activities for kids. 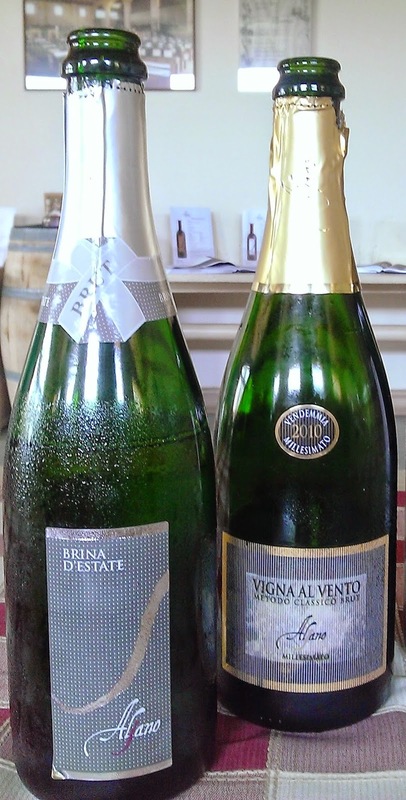 A special event happening Saturday evening at the Enoteca Regionale in Dozza where you can try the sparkling wines from Emilia Romagna along with artisan salumi and piadina. There will also be the exceptional opportunity to tour the castle, below which the enoteca is located, at night. Panzano in Chianti is a small town located in the Chianti area of Tuscany just south of Florence. 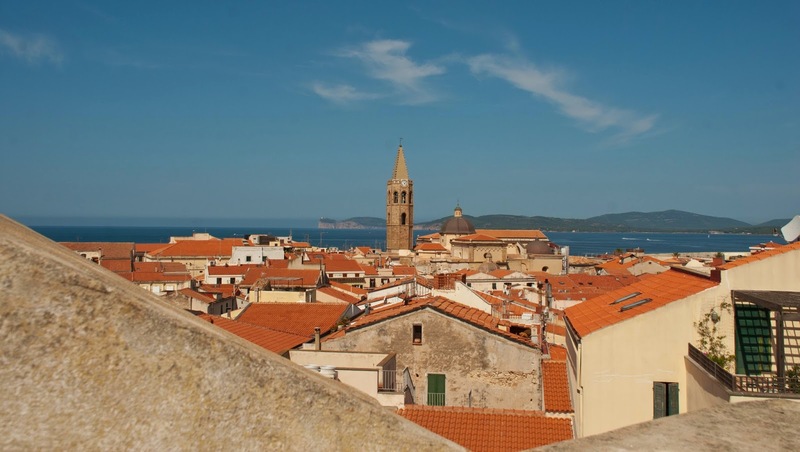 This weekend local Chianti producers will gather in the town square to show off their wines and pour tastings for all of the eager festival goers. Fifteen euros gets you a glass that enables you to taste as much as you want over the four day festival. When you need to come up for air or more likely food, head over to Cecchini’s Butcher shop for some bread and lard (That’s right! Good old fashioned pigs’ lard mixed with herbs and smeared on crusty bread.). 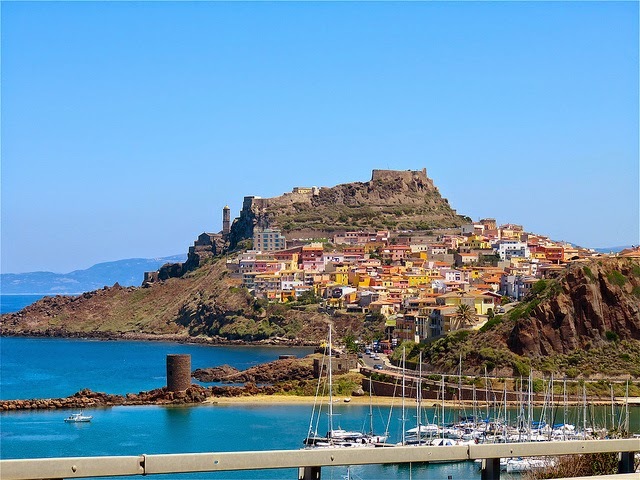 Also worth checking out are his two restaurants: Dario Doc and Solociccia (for the latter, you will need a reservation which can be made in the butcher’s shop). Here in Italy we are in the period of rientro (reentry). This is the nostalgic, somewhat sad period after the long August holiday when everyone gets back to work, the kids go back to school, and life returns to its normal pre-summer rhythm. But, before we delve too deeply into the hustle and bustle of normal life let’s hold onto summer for a little bit longer and do a vacation recap. 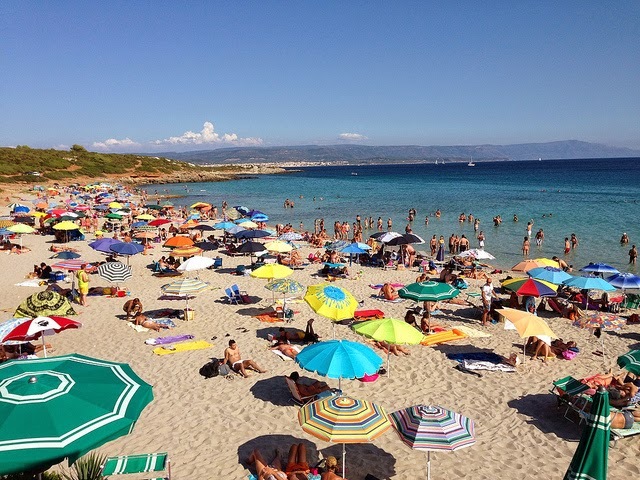 This year we finally made it to Sardinia! I say finally because it is one of those places that you constantly hear about when living in Italy. There are many people who make the trip to the island yearly for their summer vacation. Whenever I heard about it and saw the shockingly beautiful pictures (the beaches could easily be mistaken as the Caribbean), I thought that’s the vacation spot for me. I have to say, it lived up to the expectations. The beaches are incredible and plentiful! There are beaches of all different sizes from small, intimate coves to wide, sparkling beaches. The similarity between them all is the stunning, clear, 10 different shades of blue water! It really was some of the most beautiful water I have ever seen. We spent most of our days at the beach and then we spent the nights enjoying the nightlife, cocktails, local wine and food of which there was not shortage. This is not new information. 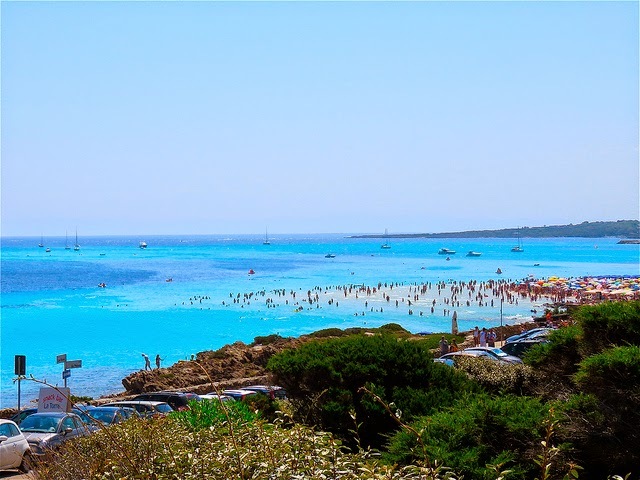 Upon telling people we were going to Sardinia the next words out of their mouths were usually – you have to go to La Pelosa. There is a reason. This beach situated at the top, northwest corner of the island is a must see. The sand is white and the shallow water stretches out for meters from the shore making it good for non-swimmers and swimmers alike. Even if you do not go in the water (I don’t know how you could resist but then again not everyone is a fish like me) just looking at it as it changes from a transparent blue close to the shore, to an aqua color and then to a rich deep blue is mesmerizing. 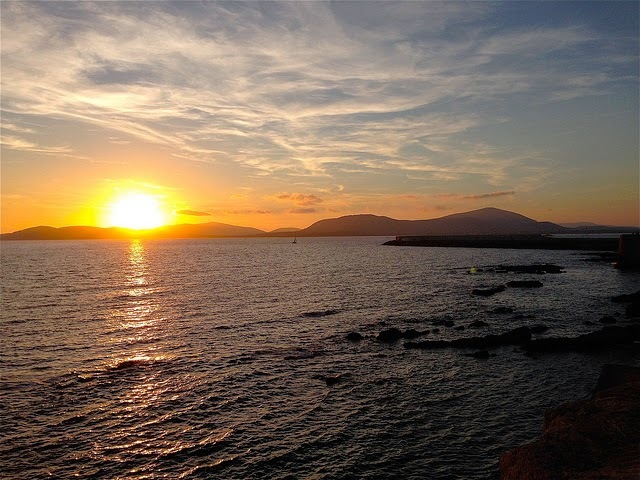 In case you get bored of just staring at the water – there is also snorkeling, a small island you can swim to or a much bigger one, Asinara, you can kayak to or take a boat to where there used to be a prison but now it is only inhabited by albino donkeys! If you need a break from the beach, Neptune’s Grotto is worth checking out. It is jam packed with stalactites and stalagmites some of which date back over a million years! It truly is like entering another world. Absolutely worth the 600 hundred stairs you have to walk down to reach it – not to mention the same 600 stairs you have to walk back up to get to your car. This is where you could find us each evening around 7:30. This little, hole in the wall cocktail bar sits atop the old wall of the historical city center of Alghero facing the sea. It is run by a husband and wife team who makes some of the best cocktails we have ever had in Italy. The spritz aperol was probably the favorite of our group (cold and refreshing) although I would have to put in a strong vote for the Mojito (fresh and generous on the rum). The outdoor seating at the bar affords you the best view as the sun sets behind the cliffs to the north and the sky follows suit and turns different shades of pink. Porceddu is the Sardinian version of porchetta or spit-roasted suckling pig. It was fantastic! The meat was tender and moist and the skin (which I typically do not eat but could not get enough of) was satisfyingly crunchy and tasty. We were stupid and only ordered 2 portions for the 3 of us to share and when we asked for another portion they had already finished the pig. Get there early so this doesn’t happen to you. Still having a bit of appetite since we couldn’t get our third helping of pig, we tried the typical Sardinian dessert Seadas a pastry filled with Pecorino cheese (sheep’s milk cheese) which is fried and then topped with honey. Oh yum! What a perfect balance of salty, creamy, crunchy, and sweet. This little shop situated in a residential neighborhood is worth seeking out. When you walk in your eyes are immediately drawn to the shelves on the walls which are filled with local products including a wide selection of wine. Once you make your way to the back of the shop you see the mother lode – a case full of cheese and meats. We had a bottle of wine and a selection of local cheese and salumi. Our favorite cheese by far was the fresh, smoked ricotta which had a distinctive smoky taste reminiscent of smoked salmon. Our favorite salumi was the salsiccia secca (dried sausage = salami) tasty, salty and perfect with the white wine. After already making our way through our first round of meat and cheese, the owner came into the shop and started offering us tastes of almost everything else available in the case. We finished the meal with local cookies dunked in sweet wine (the grown-ups version of milk and cookies). 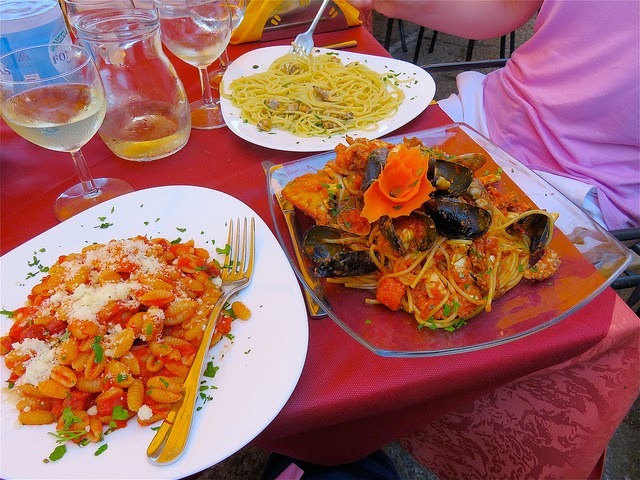 We ate at a few different seafood restaurants in Sardinia and this was by far was my favorite. They have a set menu and all of the food is served family style – two things that always get points in my book. We had 4 antipasti to begin, 3 first courses (two pasta dishes and 1 risotto), and 3 second courses including a beautiful, roasted whole fish. Wine, water and dessert was also included but we were already stuffed after the first courses so needless to say we did not partake in the desserts even though they looked homemade and delicious. If you go to this restaurant, I highly recommend you ask to have only the antipasti and the second course and skip the pasta which was the most lackluster part of the meal. It will be cheaper this way and then you will also have space left to try the desserts. Also, make sure to reserve. The place was packed. Overall, the vacation was fantastic and relaxing and, as always, I cannot wait to go back. 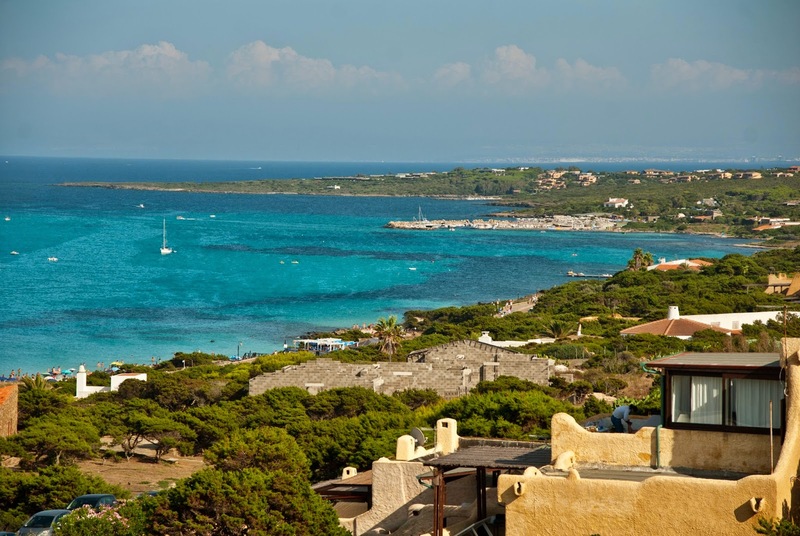 Most people when they come to Italy do not think about venturing out to the islands but I would highly recommend it. 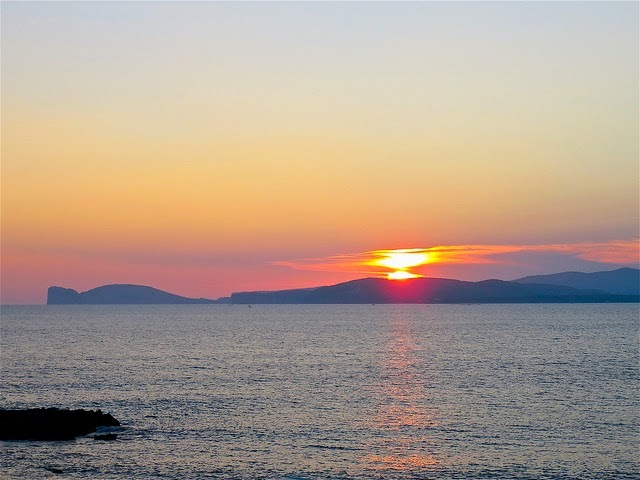 What could be better after exploring the hectic, crowded cities of the main land then to wrap up your vacation with a few days or a week on this relaxing, gorgeous island? In the month of February there can be a dip in happiness levels. The holidays and the glow they left behind has faded and we find ourselves still very much in the middle of winter with hopes of warm days still too far off in the future. Thankfully here in Italy, February marks the Carnevale period. 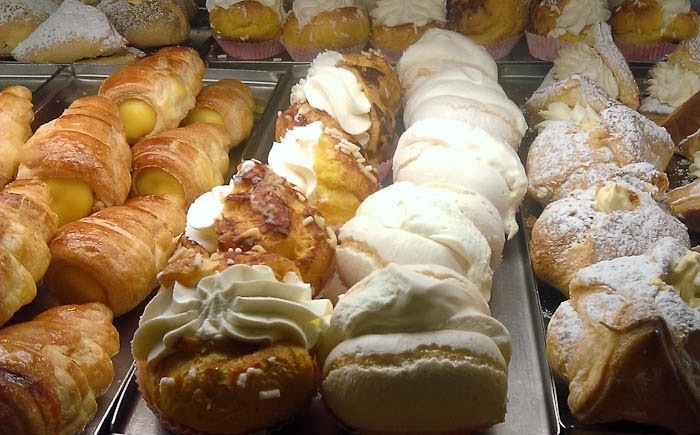 Each year Carnevale completely slips my memory until one day, usually sometime in January – in the period leading up to Carnevale, I walk into the bakery and I see the mounds of special pastries made just for the occasion. Nothing cheers me up like a tasty fried pastry stuffed full of cream! 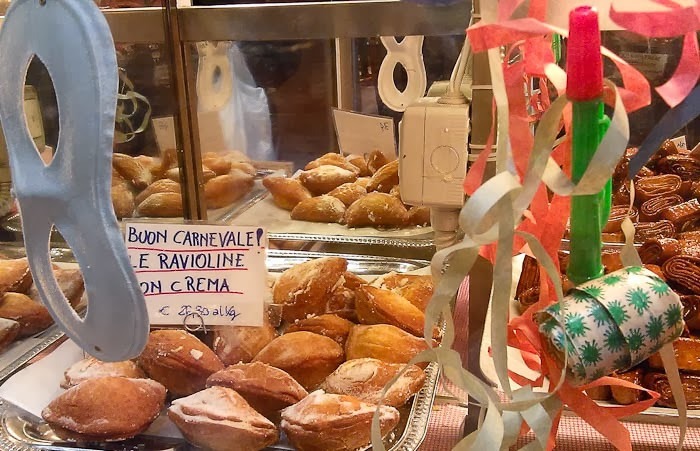 Carnevale is a period of celebration in which people are meant to use up all of their fat, sugar, and meat before entering into the abstinent period of Lent - hence the increased quantity of goodies at the bakery. 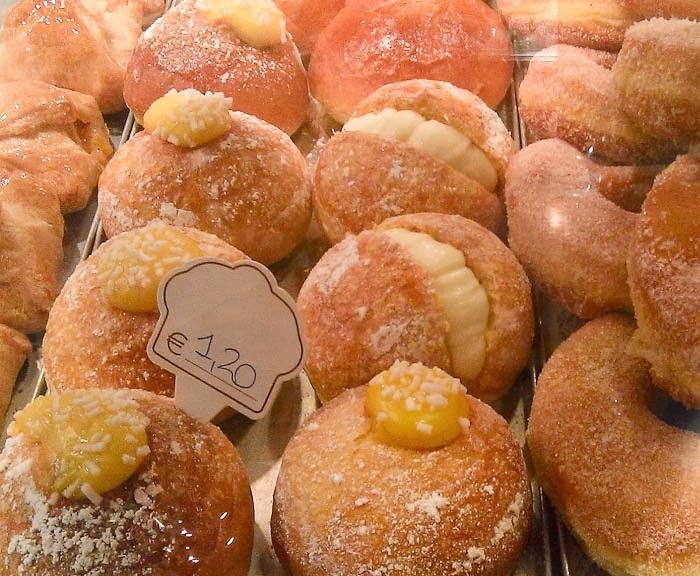 The most famous and typical dolce for Carnevale is a thin piece of dough which is fried until super crispy and then dusted with more than its fair share of powdered sugar (you are guaranteed to be a white, powdery mess after eating one). 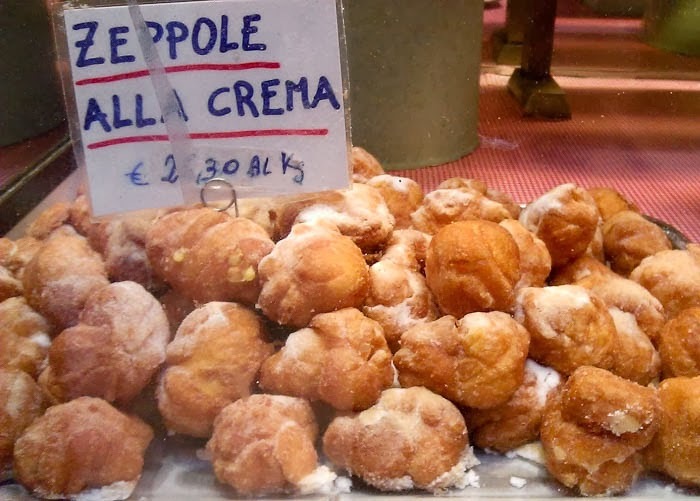 In Bologna, this dessert is called Sfrappole but it has many different names depending on where you are in Italy. 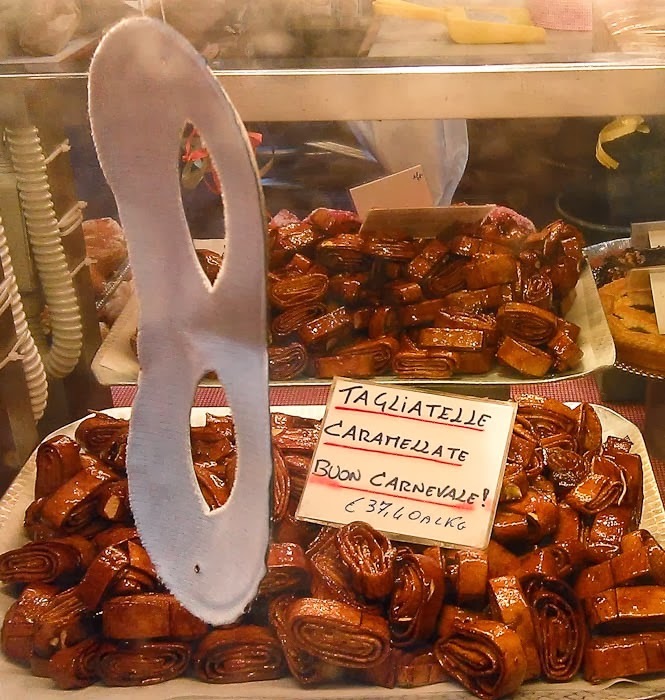 Other popular desserts during Carnevale include fried balls of dough typically filled with cream but sometimes also with Nutella called Zeppole, le Ravioline with cream or Nutella inside, and caramelized tagliatelle – a crunchy, rip your fillings out kind of dessert. This is also the period in which people dress up in costume and have parties and celebrations. If you spot a father and son team walking down the main street in Bologna in matching capes and masks, as I did the other day, do not be alarmed. They are probably on their way to a Carnevale party. 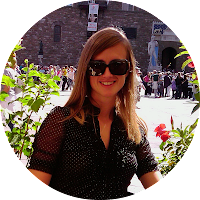 Some of the biggest celebrations occur in Venice (which despite a crushing number of people, I would highly recommend going to at least once in your life) and Viareggio, on the Tuscan coast. 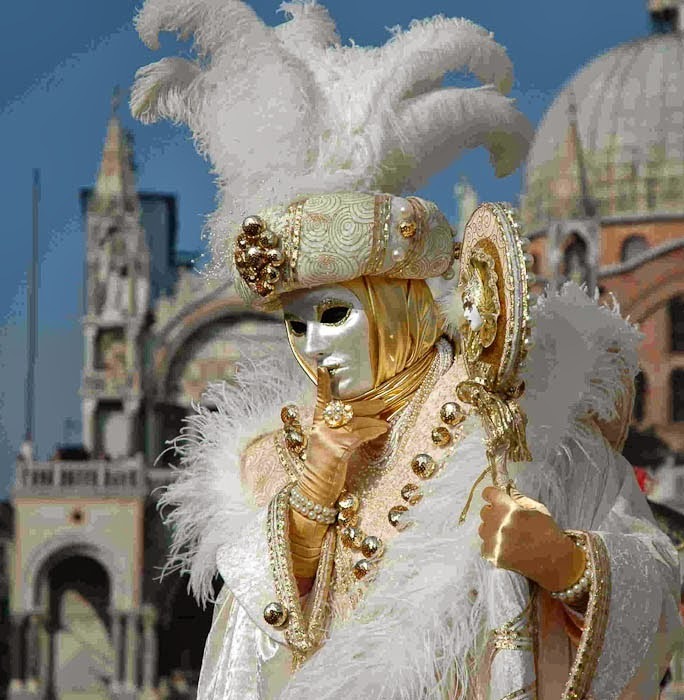 The period of Carnevale is almost over, some people would say it ended yesterday with Fat Tuesday but there are still lingering celebrations through the weekend, so go out and put on a mask and gobble up some of the goodies before they are all gone. Awhile back I told you about my favorite place for breakfast outside of the city center and now I want to share my favorite place for breakfast in the center of Bologna. Before going any further, I think it is important to clarify what constitutes breakfast in Italy. There are no big breakfasts with eggs, bacon, pancakes, and toast. If fact, if you describe a breakfast like that to an Italian you will see them squirm with discomfort at the idea and question how anyone could ever eat that much in the morning. Breakfast in Italy consists of a cappuccino and a pastry. And that is a big breakfast! I know many Italians who have nothing more than an espresso. So when I talk about my favorite breakfast spots, I am talking about a pasticceria (bakery) where they serve coffee and pastries. My favorite spot in the centro (the historical city center of Bologna) is Pasticceria Santo Stefano. When you walk in there are huge display cases on the left full of delicious pastries. If it is the weekend and I have time to spare then I examine all of the goodies in the case, make up my mind as to what I am going to order, and then make my way to the sala (room) in the back where there are many tables and chairs to sit at and even a few couches and comfy chairs which is where I usually make myself at home. If it is a weekday, then I will have my breakfast Italian style standing up at the bar; cappuccino in one hand, pastry in the other. I especially love going to this pasticceria in spring and early summer when they set up the tables outside in the street. You can enjoy your breakfast, people watch, and soak up the first rays of the day as the sun peeks up over the tops of the buildings and if you pick your table just right, you will also catch a glimpse of the Asinelli tower (the tallest tower in Bologna) soaring above the surrounding buildings. 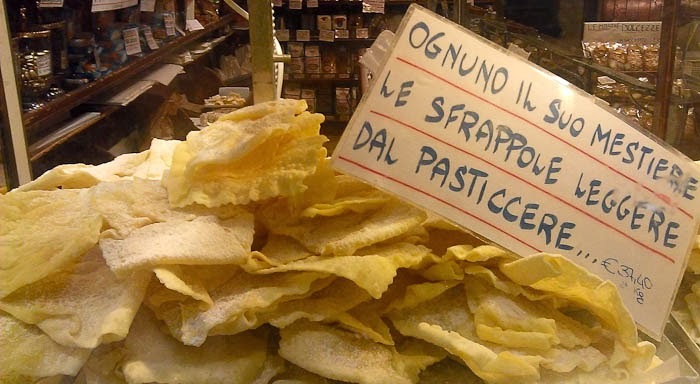 My favorite pastry is the sfogliatine con mele e crema. 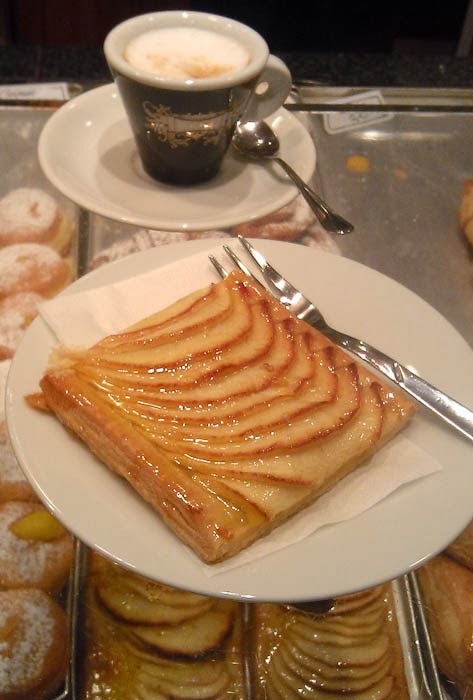 It is a rectangle piece of flaky, buttery pastry dough with a layer of cream and thin slices of apples on top. It is flaky, sweet but not too sweet, and oh so satisfying! I am normally a very slow eater but each time I order this pastry I find myself taking bite after bite until it disappears and I am left wondering where my pastry went. If you are not into sweet pastries, they also have some savory varieties. My favorite is their cereali (multi-grain croissant) which has a nice nutty flavor to it. And if you are in the mood for something a little heavier (even though you will probably get the side eye from most Italians) they often have some of the multi-grain croissants made into a sandwich with speck (salt cured and smoked ham) and brie. Yum! I highly recommend spending a leisurely Saturday or Sunday morning at this pasticceria. Order a pastry (or maybe two or three – no one will tell and I promise you I did this more than once when I first moved here) and a coffee and relax and enjoy la dolce vita.